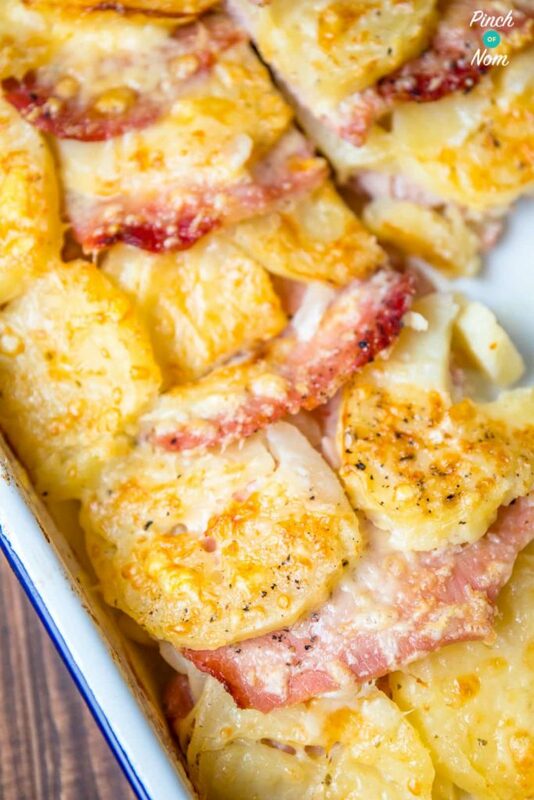 This Slimming World Syn Free Bacon, Onion and Potato Bake reminds me of my childhood, where it was affectionately known as “Tin Of Praters”. 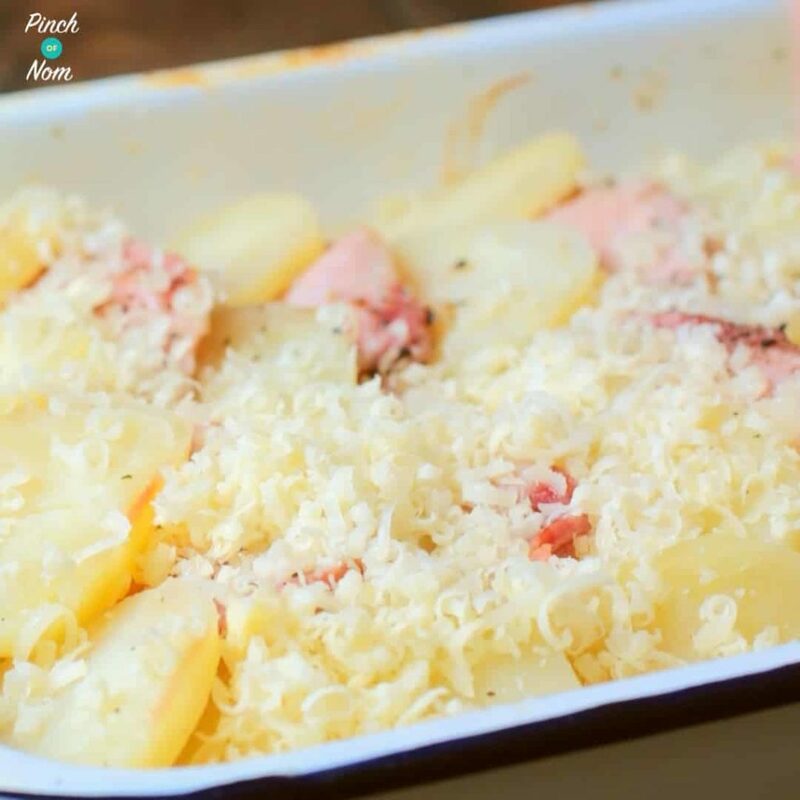 Syn Free Bacon, Onion and Potato Bake is ridiculously easy to make. Seriously! 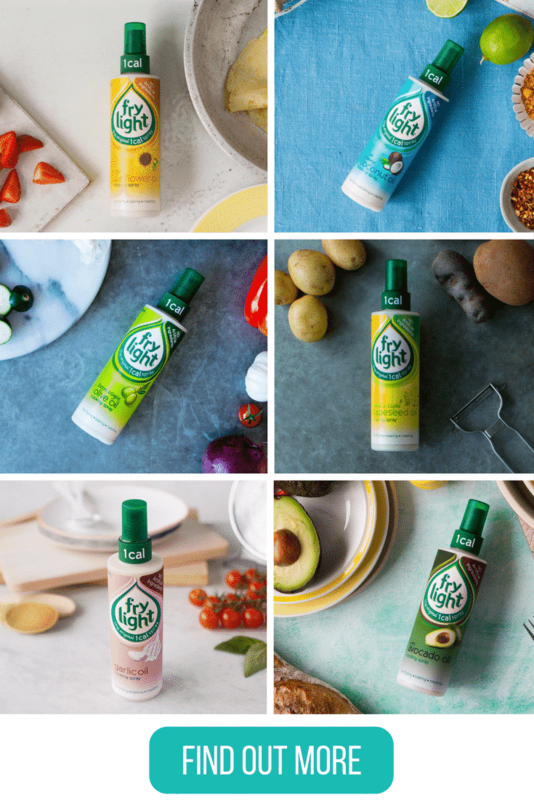 We like an easy dinner, especially if we’ve had a full day of prepping and cooking. The last thing you want to do after cooking all day, is to cook more for yourself. 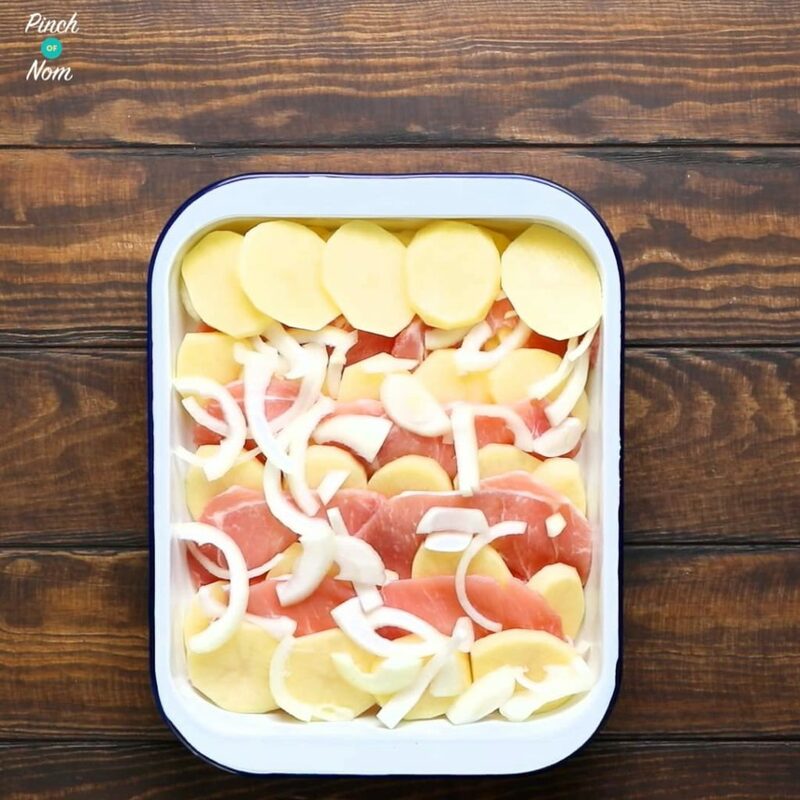 This Syn Free Bacon, Onion and Potato Bake differs ever so slightly to the one I remember as a kid. There was no cheese (boo-hiss) and I used to have it with a *lot* of ketchup. You can still have this with ketchup if you prefer, but the combination of bacon and cheese is just too hard to resist! 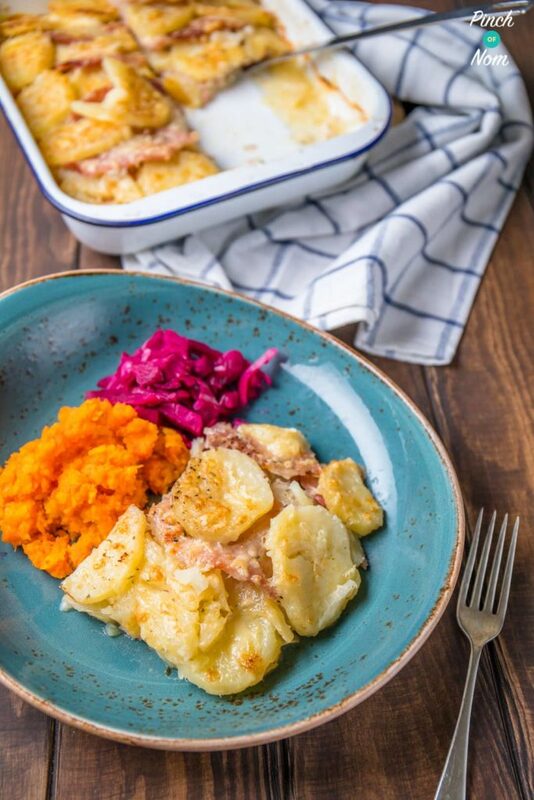 Now, there isn’t much speed food in this Syn Free Bacon, Onion and Potato Bake so it’s really important that you serve it with some! 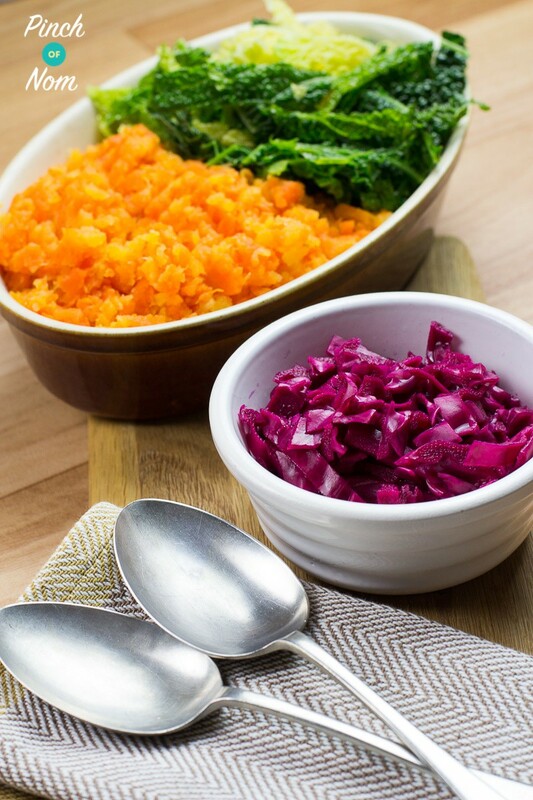 We went for our Syn free Buttery Carrot & Swede Mash, steamed savoy cabbage, and pickled red cabbage. 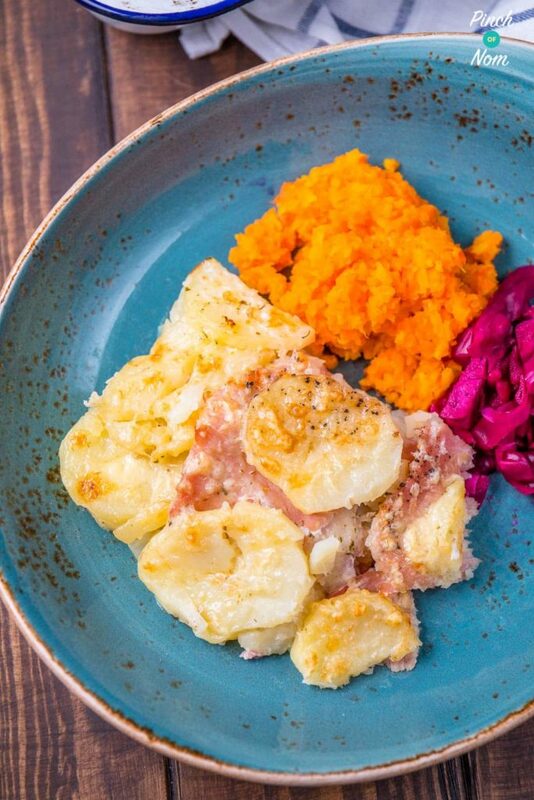 They’re all side dishes that take no time at all to prepare & are the sort of veg that we have knocking round the fridge. 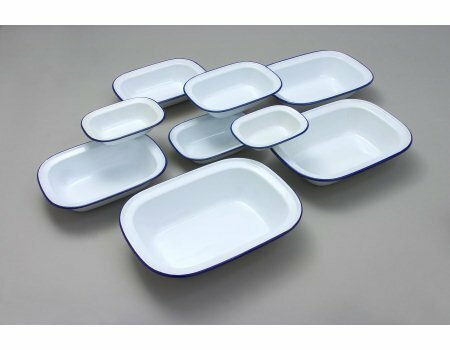 We usually make these for Sunday roast, and eat the left overs in the week. Here they come in handy! 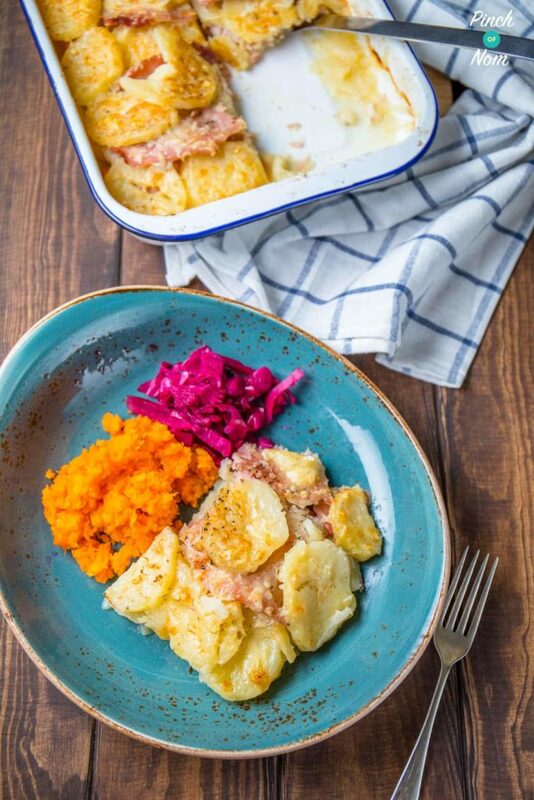 How do I make this Syn Free Bacon, Onion and Potato Bake? 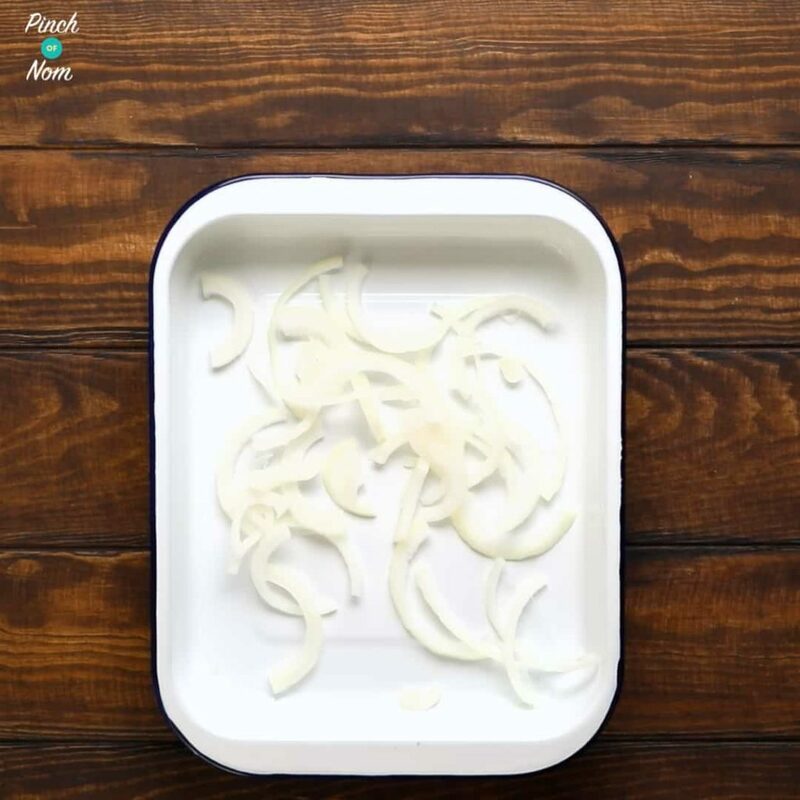 Spread a layer of sliced onion on the bottom of an oven proof dish. 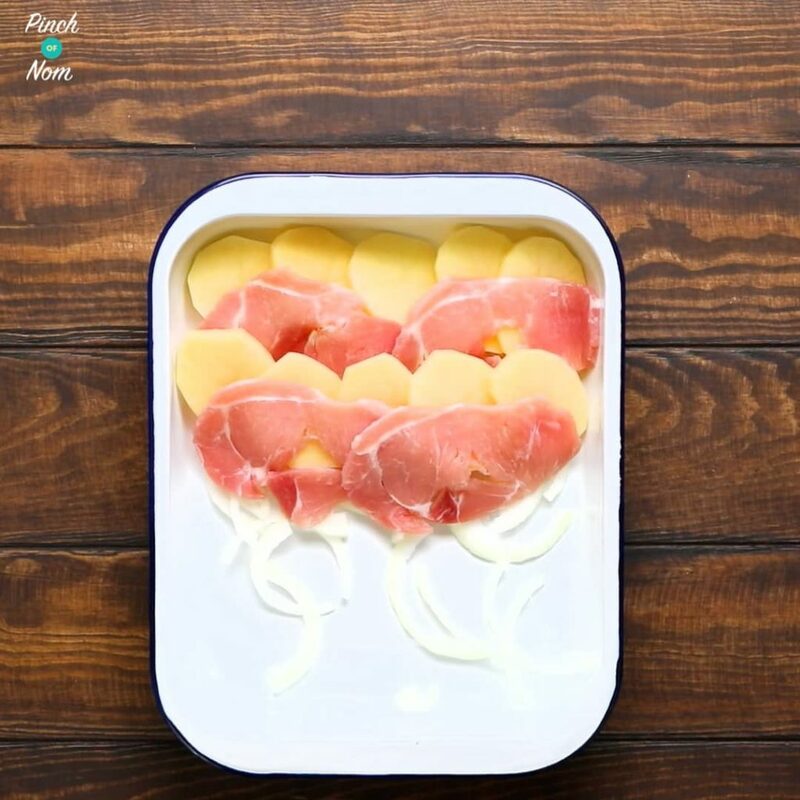 Arrange a layer of potato slices and bacon on top of the onions. 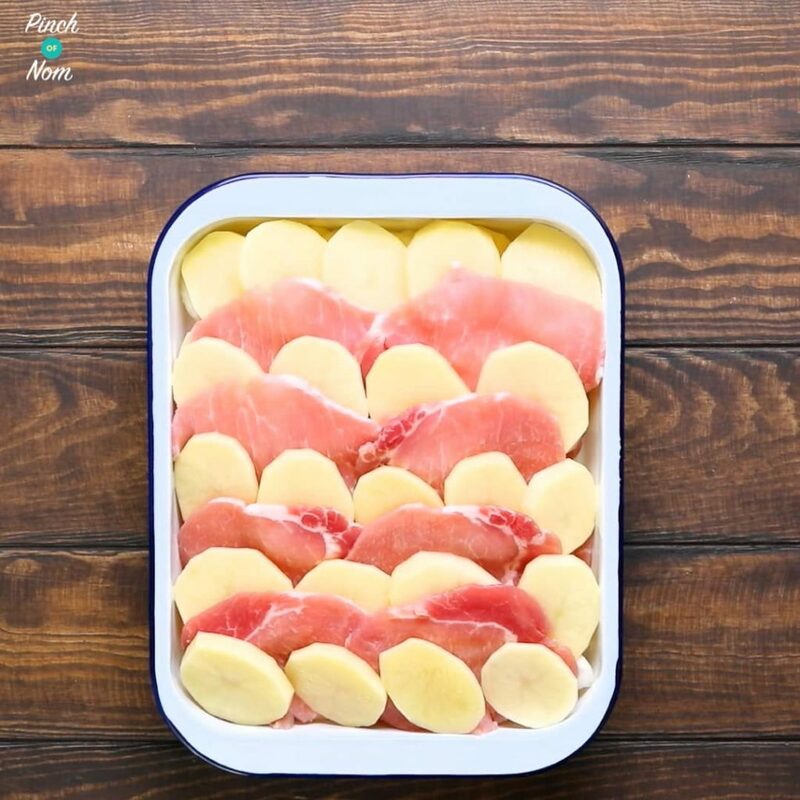 Alternating a couple of slices and potato with a piece of bacon. Next add another layer of onions. 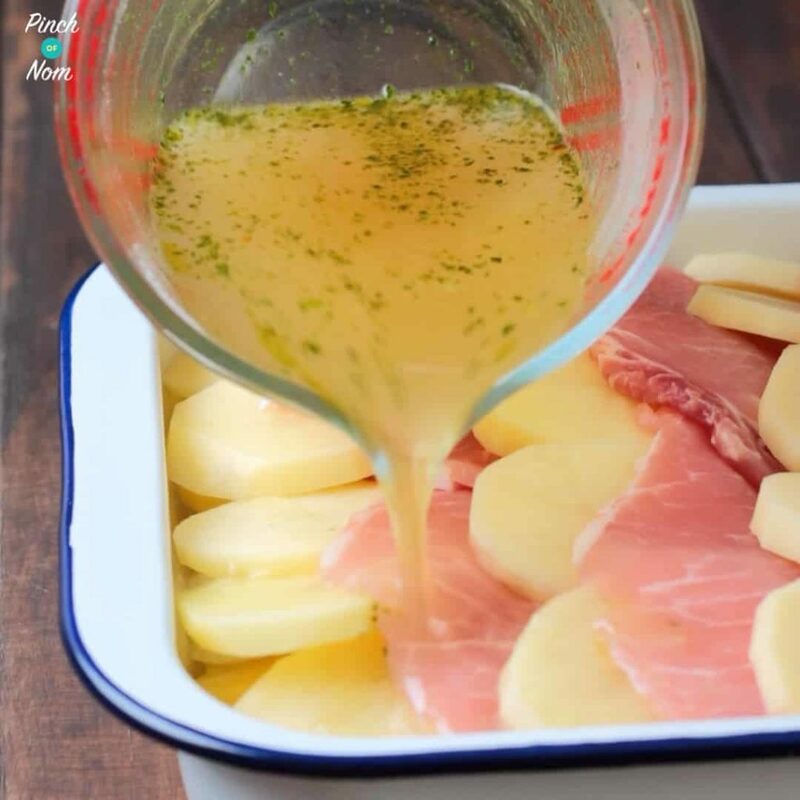 Repeat until you have used up all the bacon and potatoes. You should have a couple of layers at least. Pour the made up stock over the top, then season with a little salt and pepper. Spray the top with a little butter Frylight, then cover with foil and seal. Cook for an hour, then remove the foil and check that the potato is cooked. If not cover and return it to the oven for a bit longer. When it is cooked sprinkle the cheese over the top. Return to the oven for another 10 – 15 minutes or until the cheese has melted and is golden brown. 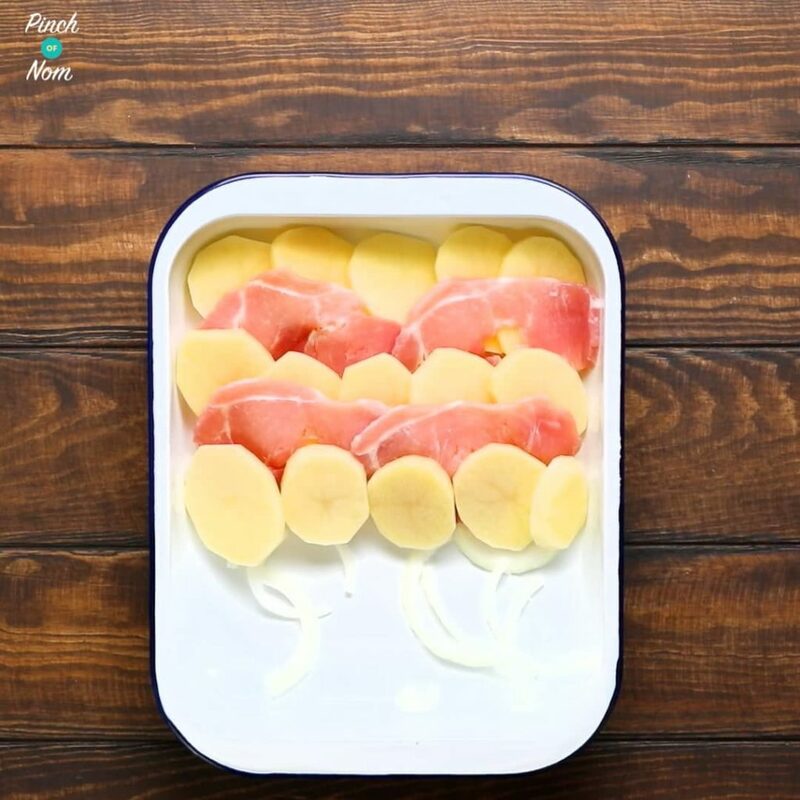 The Sunflower or Butter Oil flavours are ideal for this Syn Free Bacon, Onion and Potato Bake recipe.